Plus professional botanical illustrators living and working in Chile, Colombia and Mexico. ​b. 1952 Rio de Janeiro. (MM Scholar 1989) Studied at Kew in 1990 as first Margaret Mee Scholar and strongly influenced by the style of Margaret Mee's work. Exhibited extensively in Brazil, the US, Europe and Chile. Produced a book of Watercolors and drawings of the Brazilian flora in 2004. 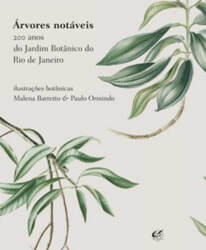 Co-illustrator with Paulo Ormindo of Arvores Notáveis: 200 Anos do Jardim Botânico do Rio de Janeiro, a prizewinning and groundbreaking book that was the first to fully illustrate and describe all the native tree species of Brazil. Teacher at the Jardim Botânico school in Rio and at various other venues. Featured in A New Flowering: 1000 years of Botanical Art. b. 1957, son of Etienne Demonte. Trained as a geologist but also a member of the Atelier Demonte in Petropolis. 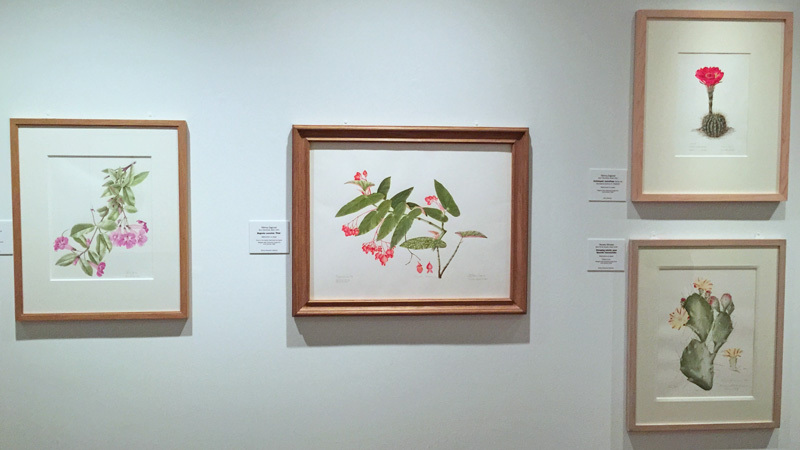 Exhibited widely in the 1980-90s including at the 'Botanical Artists of the World' exhibition at the Tryon & Swann Gallery, London, in 1998 and at the Hunt. Featured in Old and New South American Art. A Natural Science Illustrator who graduated in biology from the Universidade de São Paulo. Much of his work is dedicated to the illustration of scientific botanical articles/papers. He has also researched different approaches to illustration and artistic techniques. He has won first prize in several competitions including the Margaret Flockton Award in 2010 and 2013. Born 1981 in Rio de Janeiro. 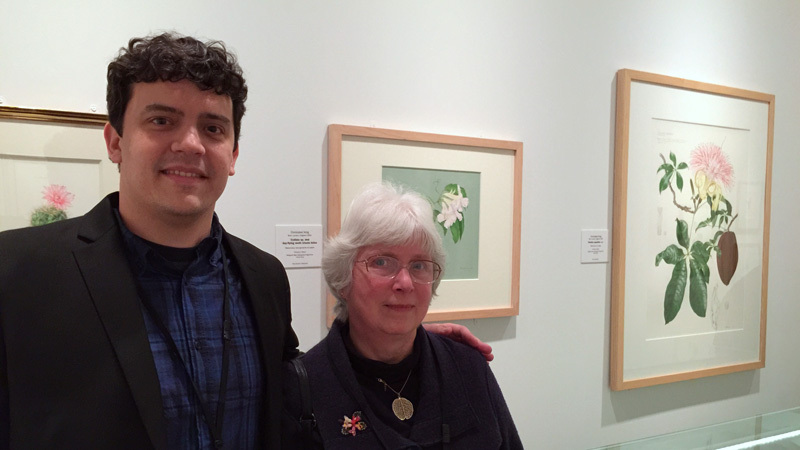 Natural history and botanical illustrator (MM Scholar 2015). He has been winning awards for his botanical illustrations for the last 20 years and has been commissioned by biologists and editors to illustrate scientific articles and books. Graduated in Design (Rio de Janeiro); won first prize in the Margaret Mee Botanical Foundation Botanical Painting Contest in 2000 before becoming an MMF Artist Scholar at Kew in 2015. In 2016 he won 2nd prize in the Margaret Flockton Award and had three of his paintings (purchased by Shirley Sherwood) included in 'Brazil - A Powerhouse of Plants' exhibition at the Shirley Sherwood Gallery at Kew. Currently teaches via workshops at the Botanical Garden of Rio de Janeiro, classes, courses and private lessons. Born Salvador, 1985. Graduated in Biologic Sciences at the Universidade Federal da Bahia. Encouraged to try botanical illustration and his first illustration in pen and ink came out in a publication. He has pursued self-stufy and courses to develop both monochrome and watercolour techniques. He focuses on black and white illustrations of scientific articles, thesis and books in botany. Won the Margaret Flockton Award First Prize in 2018 with a digital illustration of Lapidia apicifolia. (His first competition and first prize!) He now uses digital software and media due to technological advances and the difficulties in obtaining good quality support and ink. "I was born in Salvador, 1985. I have been graduated in Biologic Sciences at the Universidade Federal da Bahia, where I had my first contact with Botanical illustration. Encouraged by a Systematic botany teacher my first illustration in pen and ink came out in a publication. Since then, I have spent some years studing and taking courses in order to accurate drawing techniques. Although I also have started studies in botanical watercolor, my work has gotten foccus on black and white illustrations of scientific articles, thesis and books in botany. The challenge of finding and affording good materials for ink draw where I was based, led me to explore technological advances in softwares and tools largely used in other areas like graphic design. I was then able to use the newly acquired skills and apply them to botanical illustration. The e Margaret Flockton Award has been my first participation in a botanical art award and also the first I have been granted"
​b. Annapolis. where he lives and works. He initially qualified and worked as an architect and on urban projects. In 1989, he started to study botany in 1989 and has dedicated many years to the scientific illustration of on the scientific illustration of wildlife and botanical subjects found in different ecosystems within Brazil including some areas which have not hitherto received much attention. He also spends long periods (up to 8 months) working away while studying new plants. ​His work work focuses on the fruits of the trees of the savanna, Amazonia and Pantanal. He has taught several botanical illustration courses. In 1998 received the Jabuti award for the work of illustration Fruit Bowl Amazon, produced by the Brazilian Agricultural Research Corporation (EMBRAPA). He has also received a number of other awards for his art. He also has 29 paintings in the Shirley Sherwood Collection. Trained in Brazil in Graphic Design (1972) and in Botanical Illustration. Works as a botanical illustrator and has entered work for the Margaret Flockton Award. Illustrated the 7 volumes of the Manual de Plantas de Costa Rica - a joint project between Museo Nacional de Costa Rica, Missouri Botanical Garden and the former INBio. She has been a botanical illustrator for 25 years and her work has appeared in several other publications. ​b.1952 Rio de Janeiro. After initial training in the 70s at the School of Visual Arts , she began began her botanical art career in the early 1990s by attending the Rio de Janeiro Botanical Institute. She has been awarded a number of prizes and has shown internationally and at the Hunt Institute. ​b. 1954. Curitiba. In 1998 she began her studies of botanical art in Curitiba with Diane Carneiro. Major collections including her paintings include the Royal Botanic Gardens, Kew, the Shirley Sherwood Collection and the Hunt Institute. (Kew Gardens Collection: Echinopsis mamillosa, Fatima Zagonel). She now helps other aspiring botanical artists. This book was published in 2010 to accompany the exhibition at the Shirley Sherwood Gallery at Kew which was curated by Dr. Shirley Sherwood and Pilar de San Pío Aladren of the Real Jardín Botánico of Madrid. 68 contemporary works from the Shirley Sherwood Collection. The paintings from Spain had never been on display before. The Mutis drawings provide an insight into the development of botanical illustration in the late 18th century. Brazilian artists featured in the exhibition include the Demonte family, a dynasty of botanical painters, and the award winning Alvaro Núñez whose work focuses on the fruits of the trees of the savanna, Amazonia and Pantanal. The book also includes paintings of South American plants by non-South American artists. This book is out of print and very difficult to get hold of. I bought my copy at the exhibition at Kew. I'd recommend searching online for second-hand copies. Beware there are English and Spanish editions! Alternatively there are copies at leading academic institutions e.g. Natural History Museum in London. Margaret Mee has influenced the development of botanical art and artists in South America and in particular Brazil. 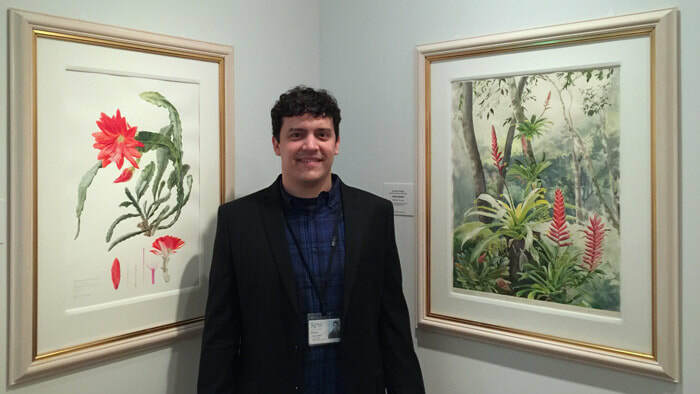 Gustavo Morigo, the 2015 Marget Mee Artist Scholar with Christobel King (in front of some of her own paintings) in the Brazil exhibition at Kew. The Margaret Mee Fellowship Programme was founded to enable botanical illustrators from Brazil to train in botanical illustration in the UK at Kew Gardens. Christobel King has been the main tutor for the artist scholars on the programme. A number of them have gone on to develop successful careers which involve working as a professional botanical illustrator and/or teaching botanical illustration. Below is the list of Artist Scholars to date who have been funded by the programme. The name of each artist is followed by where they lived in Brazil and the year of Margaret Mee Artist Scholarship award. Most studied botanical art under Christobel King's guidance. Links in their names are to their websites or to sites providing biographical information. 1990 - Dulce Nascimento, Rio de Janeiro - A practising botanical illustrator and tutor who has worked in the Amazon and drawn and painted plants in their natural habitat on a number of botanical expeditions to different ecosystems. Now a member of Advisory Council of the Margaret Mee Botanical Foundation. Her work has been exhibited internationally as well as in Brazil. Her work has been chosen as a gift to foreign royalty by the President of Brazil. She teaches, lectures and illustrates for various clients. 1991 Hiroe Sasaki, São Paulo - Born in Japan but has lived in Brazil since 1970. In 1.994 she won first place in a competition for the poster for the 46th Botanical Congress. She works as a freelance artist, undertakes commissions and has exhibited in various exhibitions. 1993 - Cecília Tomasi, São Paulo - Worked as an illustrator in the Botanical Institute of São Paulo for 30 years (1981-2012). She also taught botanical illustration techniques and was the curator of the collection of illustrations, drawings and paintings. 1995 Paulo Ormindo, Rio de Janeiro - Teaches botanical art at the Jardin Botânico do Rio de Janeiro: Instituto de Pesquisas. 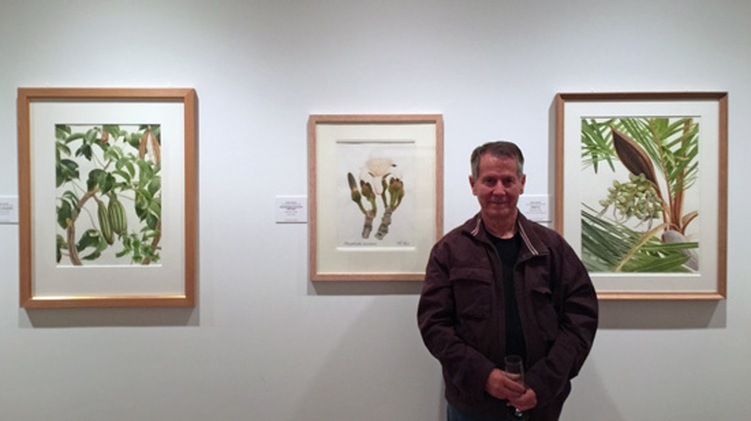 He contributed 135 black and white line drawings and 15 water colour plates to the publication "Orchids of the Chapada Diamantina, Brazil"
Jeanitto Gentilini, Brasilia, 2002 - Contributes botanical illustrations to research publications about Brazilian plants. (Kew Gardens Collection: Cyclamen graecum, Jeanitto Gentilini). Exhibited his works at the Looking at the Cerrado: plants from the heart of Brazil exhibition at the Australian Botanic Gardens in 2004. Also involved with significant landscape architecture projects. The Margaret Mee Fellowship Programme Artist Scholarship started again in 2015. 2016: Alessandro Cândido b Iretama-Paraná. Graduated in Biological Sciences from CEI- Integrated Educational Center of Campo Mourao. Commenced scientific illustration in May 2014 at Paraná Botanical Illustration Center. Selected to be 2016. An Artista Botánica - naturalista based in Santiago, Chile. She studied Fine Arts and Education at Universidad Católica de Chile. She is a Professor and Director of RBGE Botanical Illustration Course at the Institute of Geography Of the Catholic University of Chile and teaches in different places in Chile. She has been an Artist in Residence at the Royal Botanic Garden Edinburgh in Scotland (2012); National Museum of Natural History of Santiago (2016). Member of ASBA, the NTBG Florilegium Project and founding member of the Mujeres Naturalistas of Chile. Her works are found in museums, foundations and private collections in Chile, London, Edinburgh, Miami, New York and Kaua'i. She documents her work on Issuu. Main scientific illustrator for the Herbarium at the University of Antioquia for thirty years. Studied arts at the University and started as a draftsman in June 1985 and retired in December 2007. During this time she supported both botanical research and publication with her precise illustrations for catalogs, books, magazines and other academic publications. She was also a Teacher of Scientific Illustration and Watercolor in the Center of Extension, Promotion and Dissemination Artistic and Cultural, Faculty of Arts, University of Antioquia, from 2008 to date. b. Bogotá-Colombia. Studied Biology and Fine Arts. Illustrated for several specialised scientific publications in Colombia. Exhibited in Colombia, Cuba and Perú. Co-ordinated two botanical illustration contests including the first at the 8th latin American Botanical Congress at Cartagena de Indias-Colombia in 2002.The second one: a national contest to celebrate the 50th anniversary of "José Celestino Mutis" Bogotá's Botanical Garden foundation in 2005. Has taught botanical and zoological drawing since 2001. Created the "Virtual Scientific Illustration Community". Gives lectures on scientific illustration history and workshops about botanical drawing. A scientific illustrator translates the needs of a biologist with an informative purpose into images. The drawing requires absolute fidelity to the real model, its colors, the detail, to the point that sometimes the biologist himself discovers aspects in the sheet that went unnoticed, such as a bulb or a hidden hair. ....The worst thing they can tell me is that my drawing looks like a photograph.